Summary: This review of Laura Robb’s book, Teaching Reading in Middle School, is a useful resource for professional development program leaders and teachers looking for strategies to implement reading workshop in their classrooms to benefit students at all reading levels. Sharing the impetus for and insights drawn from her inquiry into reading in her middle school classroom, Robb has identified a framework that enables all students, including struggling readers, to realize that being a successful, strategic reader is within their reach. Laura Robb is a teacher who has embraced the challenge of learning more about teaching reading. Her goal, and consequently the goal of her book Teaching Reading in Middle School, is to provide a framework for teachers working with students who have given up on themselves as readers and learners. What do I do with students who can’t read textbooks? How do I find time to work with struggling readers? How do I help students reading three years below grade level feel good about reading easier books? What can I do with students who hate to read? In Teaching Reading in Middle School: A Strategic Approach to Teaching Reading That Improves Comprehension and Thinking, she presents answers to these and other questions that often perplex reading teachers. While her focus has been on the particular needs of struggling students, Robb has developed a framework that will help all students realize that being a successful, strategic reader is within their reach. The book is grounded in three independent, complimentary scholarly traditions in education: Reading Recovery, comprehension and metacognition strategies, and the process-oriented approach of mini-lessons. 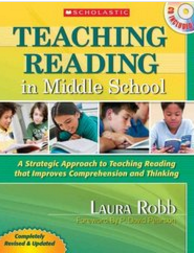 With an emphasis on middle school students, Robb outlines an approach, accompanied by suggestions focusing on mini-lessons, that enables teachers to teach reading across the curriculum and deepen students’ knowledge of how specific strategies can support their reading. A major factor in Robb’s book is the importance of choice for middle school students. She describes book-selection strategies that allow students to read at their independent and instructional levels. How can teachers support struggling readers with frameworks that improve standardized-test-taking strategies? What are some expeditious ways to organize instruction time in a block schedule or 45-minute period? How can discussion questions be framed to advance knowledge of specific genres? One of the strengths of this book is its organization. Key concepts are extracted from the text and outlined in a graphic format for quick reference. By just flipping through the pages, one can easily find answers to questions on how a strategy-based curriculum influences the teaching of reading as well as how motivation research affects classrooms. Many questions, such as how to monitor progress, keep students motivated, differentiate instruction, and assess reading proficiency, are answered in sidebar discussion charts throughout each chapter. Closing reflections on guiding students’ reading are provided at the end of the book. The resources included in the appendices are also of special value. In addition to the bibliography of professional books and articles, Robb provides a list of suggested children’s books appropriate for the reading workshop. You will find reproducible forms for everything from reading-interest inventories to activities requiring students to select and discuss a quote from the text. There are also guides to hypothesizing, inferring, and evaluating characters in fiction. Another useful feature is the list of open-ended discussion questions provided for use with fiction, realistic fiction, historical fiction, science fiction, folk stories, and fairy tales. A variety of assessment forms are included for parent-teacher conferences, book conferences with students, monitoring independent reading, partner reading, and a rubric for journal assessment. I found Robb’s suggestions to be helpful in clarifying how to organize reading workshops and highly recommend this book to anyone looking for a clear, concise resource book with practical reproducible materials.